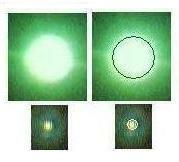 In the August 4, 2003 Walker's Hill circle, there is a pointed reference to increasing size, over a 6 day period of the Planet X complex as viewed by the human eye from Earth. This 6 day period nicely matches the 5.9 day period of rotation stoppage before the shift, and this interpretation was the one intended by the makers. 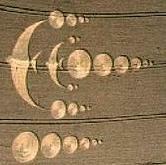 Crop circles are always given in a universal language, and a day, a full rotation of the globe, is something all cultures record in some manner or another. The photos above were taken under welder's lens, which cuts out the glare of the Sun and shows its true size. The size of the Sun, as viewed from Earth without glare, is the approximate size of the Moon as viewed from Earth. The Zetas have stated that the Planet X complex as viewed from Earth will be no larger than the Moon upon passage, and that the increase in size during the 5.9 days of rotation stoppage is showing in the Aug 4 Swollows circle. Thus, we can infer from the size of recent photos under welder's lens that the point of rotation stoppage is near! 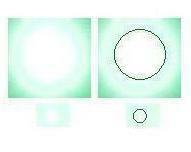 If one takes the size of circles represented in the Ohio circle from 1. center, 2. side, 3. center of halo, 4. halo, 5. slit circle, 6. inner circle, we see the same size relationships as in the Newmarket and the Swollows circles. I was looking at a crop circle that appeared in May of this year [Newmarket Hill, May 14, 2003, below]. It struck me as extremely simplistic and maybe my thoughts about it are too simple too. Maybe this is how large Planet X will appear from earth and why, if in such a placement as the last orb would create the Red Cross? It seems to somewhat coincide with the [Ohio crop circle, right]. Maybe it is the same conclusion with different information? Especially if crop circles are unfolding clues towards a conclusion.